The incredible feat in 1943 by Norwegian saboteurs to destroy the cylinders of “heavy water” being created at the hydroelectric power plant in Vemork, near Rjukan, has been well documented. There was a Norwegian movie in the late 1940s (which I saw in Norway), and then there was the movie with Kirk Douglas, The Heroes of Telemark. Knut Haukelid, one of the saboteurs, wrote a book on the feat called, Skis Against the Atom. Recently, Neal Bascomb wrote a very comprehensive book on subject, called The Winter Fortress. Andrew Gross, an author of thrillers, who had collaborated with James Patterson on five thrillers and has written another nine thrillers of his own, all on The New York Times best sellers list, became intrigued about the incredible feat of these Norwegians in WWII. Gross, of Westchester N.Y., wrote The Saboteur focusing on one of the leaders of the saboteur team. Although I am familiar with the story, having read one of the books above and seeing two movies on the subject, I found that Gross’s writing style was very captivating and held my attention until the very end. The main character is Kurt Nordstrum, an engineer in Oslo, who joins the Norwegian resistance shortly after the German invasion of Norway. The character somewhat resembles one of the actual leaders of the saboteur team, Knut Haukelid. Kurt is from the area of Rjukan and, along with several other young men in the resistance from the area, is recruited to perform effective sabotage. Their first task is to get to England, where they will be trained. After they take over a coastal passenger ship, which they direct to England, they undergo an intense six-month training period. The story details their treacherous parachute drops in the hilly, snow-covered area near Rjukan. The writer details the team’s clever means to reach the large containers of heavy water and their subsequent destruction and then their escape into the mountainous area around Rjukan. Most of the saboteurs travel on their skis in extremely cold weather to eventually reach Sweden, while Kurt remains in the Rjukan area to recruit more saboteurs for the future. Some months later, Kurt and some of his other recruits manage to get on a ferry holding a number of heavy-water cylinders destined for Germany. They plant dynamite to blow up the ferry in middle of the lake. That was the end of heavy-water production in Norway and was believed at the time to be a significant setback to German efforts to develop an atomic bomb. Andrew Gross had learned quite a bit about the history of the heavy-water destruction, Norway in that region, and in particular, Norwegians under German occupation. He brings his skills as a storyteller to add extra dimensions to the heroic feat. From the beginning, Kurt is hunted by a Norwegian Nazi chief who knew Knut from school and was always jealous of him. Then there was a lovely young lady whom Kurt met shortly before dynamiting the ferry. Learning that she would be on the ferry, Kurt boarded it that morning to alert her before the actual explosion. I was not the only person who loved this thriller. 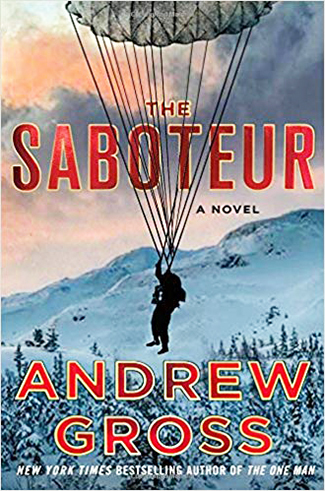 The Associated Press stated, “Gross has written his most heartfelt and compelling book to date, and fans of World War II fiction should add this to their reading list.” To read more about some Norwegian WWII heroes and enjoy a great thriller, try Gross’s The Saboteur! Born in Stavanger, Thor A. Larsen immigrated to New York City with his parents in 1948. Now retired from a 40-year career as physicist and engineer, Thor draws and paints, and writes travel and arts articles for a local publication. He’s been married to Arlene for 49 years, and they have two adult children and three grandsons. This article originally appeared in the September 7, 2018, issue of The Norwegian American. To subscribe, visit SUBSCRIBE or call us at (206) 784-4617.